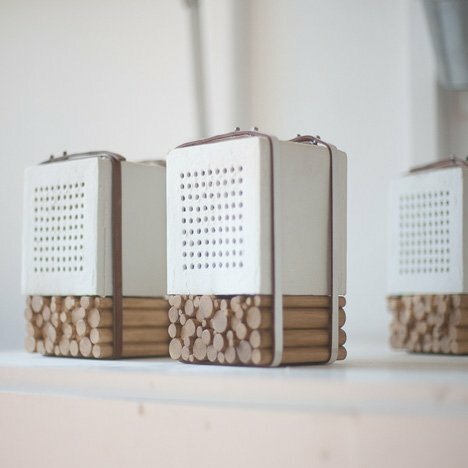 Korean designers Joon&Jung have hand-crafted this set of speakers by strapping punctuated ceramic cubes onto a stack of twigs. The combination of materials gives a slight echo to create a more natural sound. The idea for the ‘the natural speaker’ derived from the desire to create an absolutely unique, handcrafted speaker for the interior space. Whereas a lot of speakers are constructed to produce a rather fat bass and sharp high tones, we felt the sound was kind of stuck inside the speakers, missing a natural vibe and ambiance. During the development of the ‘the natural speaker’ we discovered the great properties of porcelain as a speaker casing, providing a clear resonance and mellow sound. Amplified inside the ceramic and wood transmission construction, the sound gains a slight echo, creating a natural feeling of resonance, resembling the distinct flair of an acoustic instrument right in front of you. Each set of pieces is individually crafted by hand and each procelain casing checked for best amplifying performance. If you value a balanced midtone sound and a speaker with a ‘feeling’ for your music, you will surely enjoy the ‘the natural speaker’.